Until fairly recently, the formal teaching process has usually worked on the principle of diffusion, where a person of high knowledge concentration (the teacher, guru, master) is placed in contact with people of low knowledge concentration (the students, disciples, acolytes) and the knowledge flows into them. This traditionally takes the form of the learned person standing in front of the learners and explaining what it is they should know, hopefully (but by no means always) in a way that can be understood. As far back as 150 years ago, humourist Mark Twain is credited with saying: “College is a place where a professor’s lecture notes go straight to the students’ lecture notes, without passing through the brains of either”, which pretty much matches up with my recollections of Statistics lectures. In recent times, educators have looked more closely at the disconnect between the way teaching and communication takes place in classrooms and lecture theatres, and the way it takes place in the rest of the community – and a revolution has ensued. Collaborative learning has now become the preferred practice and is picking up momentum as it relentlessly sweeps previous pedagogical models before it. Nowhere is this trend more obvious than in the huge new CBD facilities of the University of Technology Sydney. The recently-opened Faculty of Engineering and IT (FEIT) building is an excellent example of this trend. Lecture theatres in the FEIT are designed to allow lecturers to interact directly with individuals and small groups. No longer are students expected to go to a hushed library or computer lab and work in silent isolation. UTS expects today’s students to gather in unstructured working groups to learn together and from each other as they continue the collaborative processes begun in the scheduled sessions. The current UTS redevelopment has prompted the university to undertake a rethink of its teaching technologies and its user interfaces. The upshot of this was the design of a new lectern system (now referred to as the Lectrum Lecture Centre) that would not only work across all the teaching and presentation spaces in the three buildings under construction, but also be suitable for retrofitting into existing spaces. Unlike the conventional lecture theatre arrangement, these tables needed to be freestanding and capable of operating in the middle of a room or in a small space, well away from any supporting technical infrastructure. The tables had not only to be far more sophisticated in their capabilities than previous generations of lecterns, they also had to house the entirety of their control and processing electronics, which must of course be readily accessible for servicing, maintenance and reconfiguration. And because the tables would be used in flexible and reconfigurable spaces, they also had to be able to act as both a full-height lectern for a standard lecture presentation and a standard-height table in a tutorial or collaborative learning situation. Despite the risk that such a device could not be built without a serious compromise to some aspects of its performance, an intense design process involving everyone from academics to mechanical, electronic and electrical engineers and an industrial designer from the Faculty of Design Architecture and Building, resulted in a design that meets all of those criteria. 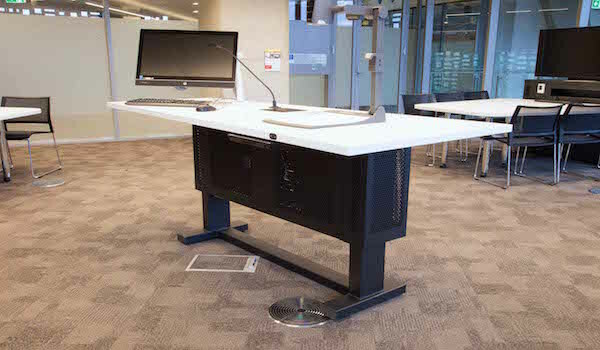 Effectively an adjustable-height table, with under-slung AV racks and a presentation and control work surface, the Lecture Centre takes care of all its own signal processing, storage and replay, requiring connections only to mains and data networks, beyond the audio and video display devices in the space it operates. 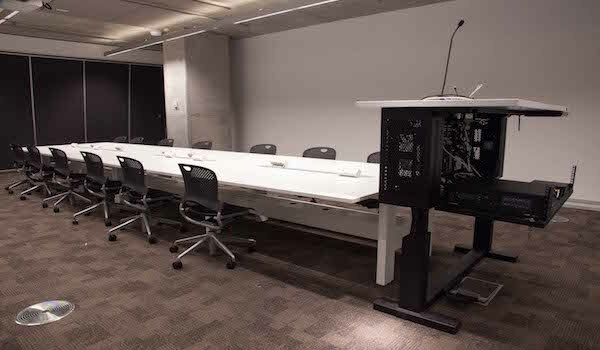 UTS put the manufacture of the Lecture Centre out to tender and engaged Wilson & Gilkes, well known for producing AV hardware and such things as equipment racks and iPad storage and transport dollies. After producing a range of manufacturing prototypes and solving some of the unforeseen construction problems, Wilson & Gilkes went on to manufacture, assemble configure and load the electronics into the tables, then warehouse and deliver them as they were needed for deployment in the FEIT building. 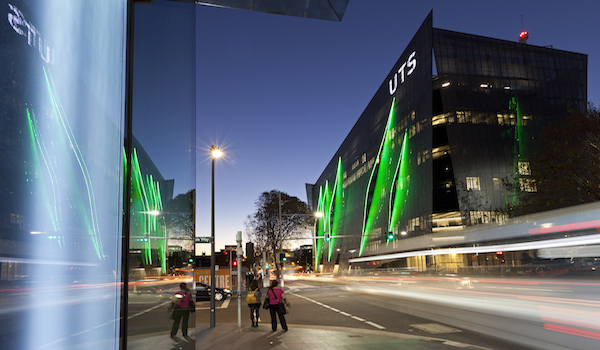 The special commission is now being marketed by Wilson & Gilkes as the Lectrum Lecture Centre – UTS Edition. Amongst the 140 Presentation Tables that will be rolled-out across the new facilities, there are 40 distinct variants for specific purposes, including a wide selection of table sizes and table-top materials to match the design aesthetics of the individual spaces. Core to the capabilities of the tables lies in the 3RU Crestron DMPS-300 DigitalMedia Presentation System which packs in all the multimedia matrixing, digital and audio signal processing and signal amplification and distribution required for a modern teaching or presentation space. A typical UTS Presentation Table would also incorporate a Sony Blu-ray player; a Wolfvision desktop document camera; a Shure gooseneck microphone and a Sennheiser radio microphone and receiver; an HP all-in-one touchscreen computer on a Flo monitor arm; Extron USB-over-Ethernet interfaces; Extron 100V line local amplification to drive ceiling speakers and a hearing loop; Linak linear actuators and controllers for electrically adjusting the height of the table; an HD-BaseT media transmitter, and a Cisco gigabit network switch. However, the flexibility of the table design allows for a vast range of customisations for specific types of presentation and will allow the table to keep adapting to changes in technology and applications for some time to come.